As parents, we are busy. It never ends. Busy with work, busy with kids, busy with stuff that always needs to be done around the house. We are always rushing. Always trying to get all the ‘stuff’ done.We finish something earlier than expected. Do we sit down and relax for a bit? Enjoy a hot cup of coffee? Read an extra story to the kids? Stand in the sunshine and daydream? No. We try and get something else done. A task. Another thing to do on the never-ending to do list. You know what? We need to stop. We need to take a breath. 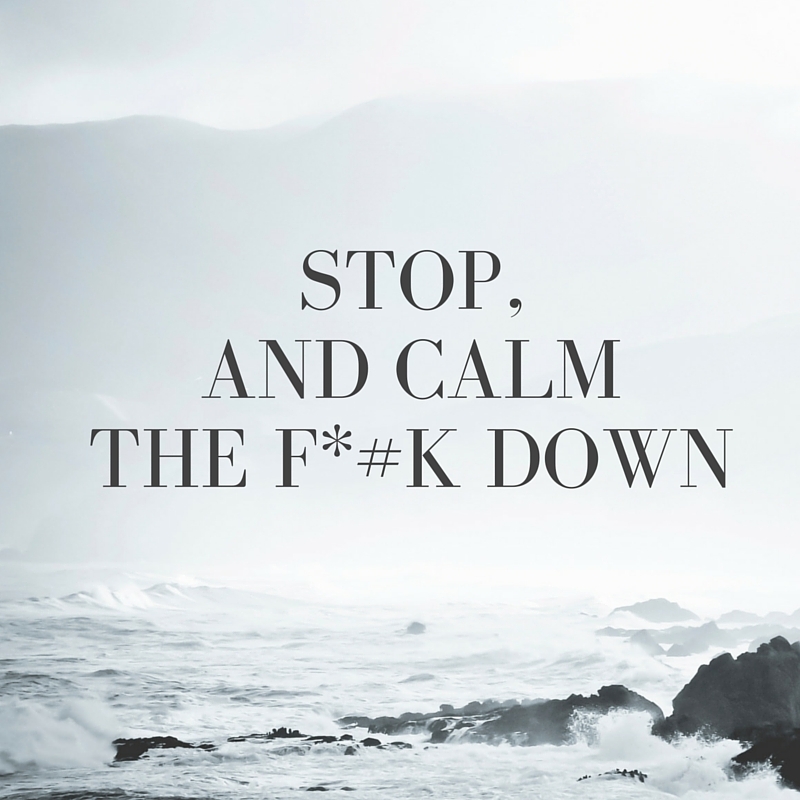 We need to basically just calm the f*#k down. I read something the other day about a mum who heated something in the microwave for a minute and felt guilty for just standing there, watching the timer count down, instead of getting something else done. A minute. Wow. When did it become ok to feel guilty about standing still and just breathing for one minute? No wonder we feel stressed, stretched to the point of breaking. Is it really a surprise that we (as parents) get sick from burning out? That most of us are probably living in such a state of busyness that despite feeling exhausted, can’t fall asleep at night because our brains are still whirring? I’m not saying that I don’t pause. I do. Sometimes. I blame my Type A personality for making me try to squeeze as much out of the day as I can. Do I like waiting in queues? No. I always think of all the other stuff I could be doing during that time instead. Do I stand and just watch the microwave timer count down? Sometimes. Most of the time though I try and see if I can unstack the dishwasher before the timer beeps. Or chuck on a load of washing. I don’t like to feel I’m wasting time. But it’s not really wasting time if we’re looking after ourselves. If we’re taking a moment to breath properly, or to look out the window and turn off your brain for a minute. I’ll be the first to admit I need to take a moment more often. So let’s take some time out to recharge and look after ourselves. It doesn’t have to involve a week-long holiday somewhere exotic, as lovely as that would be. It is as simple as taking half an hour for just you. Here are some great ways to help slow down, unwind and recharge yourself. Sit down with a good book and lose yourself in it for a little bit. Make a cup of tea or coffee, and drink it while it’s hot. Go for a walk, run or gym session. Call a friend for a chat. Write it all down. If your brain is racing a million miles an hour, jot all those thoughts and things you’re trying to remember to do down on paper. Brain dump. Put on your favourite music and dance. Lie down. You don’t need to sleep, but just lying still can help. Bake or cook something you love to eat. Then make sure you enjoy it too. Stand outside and soak up the sunshine. Yes, we’re all busy. Life is busy. But life is too short to race from one thing to the next and not take a moment every now and then. Let’s be kind to ourselves a bit more. I promise I’ll try and be kind to myself more often. Will you promise to try and look after yourself more too? What are some of the things you like to do to slow down, unwind and recharge yourself? Make sure you’re following Life, kids and a glass of red on Facebook for extra giggles and snippets of silliness! As a matter of fact today I left the housework alone and watched a movie. IT WAS AWESOME! Totally agree with this post. I this fast-paced world people (especially mothers) feel guilty for pausing for one second. I make it a point to do something calming every day – a walk, a book, sitting down, sometimes even shutting my eyes on the couch for a quick power nap. Everyone needs to SLOW DOWN. Very passionate about this and have written about this topic myself on my blog. Fabulous post- we need to care for ourselves so that we are fit to care for others! I find the only way I get uninterrupted down time is when the kids are no where in sight, otherwise I get hounded the entire time. Oh gosh I hear you there Malinda! Oh mate, seriously, I am so bad for this. It’s not necessarily because I feel guilty for stopping, it’s because I feel like a shark that never stops moving. There is ALWAYS something else that needs doing, so it’s become a habit for me to just keep going! I love cranking the music up and having a crazy dance party in the kitchen – it perks me up and entertains the kids, win win! Yes exactly!!! I like to have a cuppa and read a totally trashy magazine that I don’t need to think about! One day I was so busy doing stuff for the kids/house stuff that I forgot to eat my lunch. When I finally went to eat it, the ants had found it. Man I was cross with those ants. But it reminded me I need to stop for long enough to eat! I always feel busy. My head is a crazy place most days. I can cope with it on most occasions, but when someone gives me something extra to think about it, it threatens to send me over the edge. I find if I don’t plan time to relax, I won’t. So I plan it. Otherwise it’s all just a mess! Great tips. Taking care of ourselves isn’t a luxury, it’s necessary if we want to do the best job of taking care of others. I’m rather partial to some adult colouring in – I just colour my way to peace and calm in a matter of minutes! I absolutely need to do this more. And I bet sneaking a look at Facebook while the kids’ dinner is cooking doesn’t count, does it? I love sitting out in the sun with my puppy, just hanging, doing nothing. WE all need to do nothing sometimes. I love sitting in the sun with my puppy, just hanging out, doing nothing. We all need to nothing sometimes! Great post, great reminders! I like to do all of these:) I’m trying to put myself on my To Do List every day, not easy but necessary. So, what you’re telling me is that I shouldn’t be working on my blog while lunch is on the stove and the laundry is in the washer? I can finish this comment before the timer buzzes, right? 😉 I did, however, take a bubble bath a few nights ago, while my husband handled dinner and the children. It was bliss! Pingback: Turn It Up Tuesday - Does Your Sister Have Normal Hair? Make you at least put on your favourite music then, or grab a takeaway coffee to enjoy!